Though I won't explain the process in too much detail, I will be outlining the general process of what it will take to qualify for the 2012 Olympics. The reason why I'm only saying the 2012 Olympics because qualification processes have been very different in the past. I will be briefly outlining World Rankings in Badminton as well, because qualifying for the Olympics has always been based on this. Lastly, I will emphasize Doubles events (Men's Doubles, Women's Doubles, and Mixed Doubles) more, as that is what I'm most familiar with. To start off, let's explain World Ranking in Badminton. World Ranking begins once you've played two tournaments. With Doubles events, you must also play with the same partner. If you play two tournaments with two people, you won't get a ranking until you've played two tournaments with the same partner. Technically, if you play two tournaments with two partners, it's possible to have two different World Rankings. World Ranking is based on points you attain in a tournament. You will gain points as long as you show up and play, even though you may lose in the first round. However, since larger tournaments have limited spots in the Main Draw, there are also qualification rounds you may have to get through should your ranking not be high enough. Tournament entries list the teams in order of their ranking (with an exception in Doubles events), so they higher the World Ranking, the more likely you can start in the Main Draw. Generally, there are 28 spots in the main draw, leaving 4 spots for qualifiers. This makes a draw of 32. Within the qualifying draw, there are 16 teams, qualifying for 4 sports. Should you lose in the very first round of qualifications, it would be considered a 128 draw, and losing in the 2nd round of qualifications would be considered a 64 draw. The higher the prize money for the tournament, the more points you get for the tournament with the exception to World Championships and Olympics, which give you the most points but no prize money! Tournaments have a particular name now for the amount of prize money they offer (in addition to World Ranking points). From lowest to highest, we would have Future Series tournaments, International Series tournaments, International Challenge tournaments, Grand Prix tournaments, Grand Prix Gold tournaments, Super Series tournaments, and the newly formed Super Series Premier tournaments in 2011. Lastly, a BWF event tournament would count for the highest level tournament, such as World Championships, Olympic Games, and the team events of Thomas Cup (Men's team tournament), Uber Cup (Women's team tournament), and Sudirman Cup (Mixed team tournament). World Championships are held every year with the Olympic Games alternating every 4th year, while Thomas/Uber Cups rotate with Sudirman cup every other year. For a list of points, refer to the BWF Ranking Overview. Although it looks like it's better to play more tournaments, only your best 10 tournament results count. You can play more tournaments to replace weaker scores and generally, it is in your best interest to play at least 10 tournaments. For each player/team, their top 10 tournament results are added together and the final result is used for World Ranking purposes. World Ranking updates every Thursday (North American time) so new tournament results will be added in every week. World Ranking is also cyclical, as it only counts the top 10 tournaments over a one year period. For example, if I play the Canadian International Challenge and win in April 2010, I would get 4000 points toward my ranking (International Challenge winner = 4000 World Ranking points). However, if the tournament is canceled the next year, unless there is another tournament to replace it, I would lose those 4000 points from my ranking. If the tournament is held again, I would need to win the tournament again to keep my points. Anything less than a win would result my ranking to go down. From this example, it is easy to see how World Ranking can fluctuate tremendously. However, if the tournament is held a week earlier, I would gain points for both tournaments on the nearest ranking date. But nonetheless, it is only temporary as I would lose my points once I overlap the dates from the tournament of the previous year. A couple of miscellaneous concepts I will highlight are notional rankings for tournament entries, and team event points. Notional rankings is for seeding purposes and helping good players who form new teams have a better starting point. Although only used in tournament entry lists, if a new team were to form, they would technically have no World Ranking together as it may be their first or second tournament. However, to compensate for that, they take will take half of the points from each player and add them together to give a rough placement of where they can start in a draw. This only applies for Doubles events. The easiest way to give an example is that a new team may have less World Ranking points than another team only because they have played less tournaments. Because of that, they will divide ranking points by the number of tournaments (minimum 5) to find a team's notional ranking. Hope that isn't too complicated... o__O Team points are much easier to explain. They are only gained from team events and you can only have one team event point score per year. In the team event, as long as you play someone, even if you lose to them, you would get an average score of your top 10 tournaments. For example, if you had 30 000 points from 10 tournaments, your average will be 3000 for that team tournament. However, it can only count once, and the higher team average will be counted for that year. If your opponents have a higher average than you and you beat them, you can actually gain their average! But it can also happen the other way, if you lose to a weaker team. They will get your average and you will get your own average in the end. Now that I've explained most of World Ranking, to qualify for the 2012 Olympics, I would need to theoretically be within the top 16, as only the top 16 teams get to compete in Badminton at the Olympics for Doubles events. The qualification period has already begun, as it started on May 2, 2011. It will end on April 28, 2012 (with the final ranking taken on May 3, 2012) and the top teams will be announced. Though it seems pretty ominous, there are a couple of extra rules which will help some of the struggling athletes. For Doubles, since only 16 teams are allowed, a country may only have two teams participating if they are both in the top 8. For example, if China holds #1, #4, and #10, only the teams #1 and #4 would go, with team #10 being omitted. If China holds #1 and #9, then only one team gets to go, as only one team is in the top 8. However, they could choose to send #9 in place of #1, though that is highly unlikely. As a few countries will take up more than a few spots, there will be a few teams omitted, thus giving more of a chance for other countries to qualify. Lastly, there is a continental position. Since Europe and Asia generally secure positions already, there are continental spots left for Africa, Pan America (North & South), and Oceania. However, the team has to be ranked within the top 50, otherwise they will have to give up the spot. This offers a much better chance to some teams, as the draw is so small already for the Doubles. Singles is slightly different, as there are 38 spots allotted. There are some different rules, but usually it is easier to legitimately qualify for Singles, provided you are the top player in your country and are ranked high enough. There are also a couple of wild-card spots for the Host country, but I am not too familiar with those details. If you have any questions, please feel free to leave a comment/question and I'll try to get back to you as soon as possible! 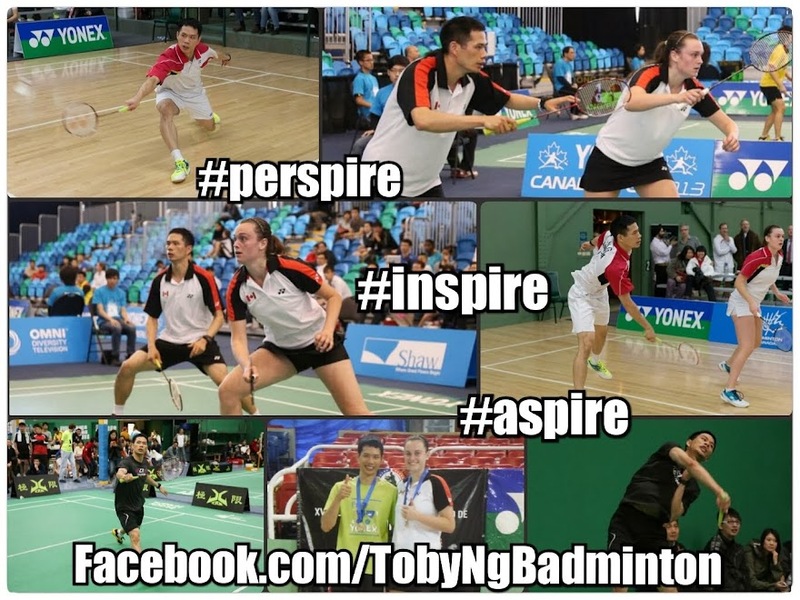 For further information about Badminton at the 2012 Olympics, please visit the BWF Website.